The server running MariaDB MaxScale has two ports, one where the application server connects and one for monitoring. We want to make sure that we can access the MariaDB Server from either host, but that we have access and can use any command that is granted to the user in question in the database server only when accessing from the application server. In the following we assume that MariaDB Server is already set up and that it is configured to use the proxy protocol (which in turn assumes that we are running MariaDB Server 10.3), see this page in the MariaDB Knowledge Base for more information on how to use MariaDB Server with the proxy protocol https://mariadb.com/kb/en/library/proxy-protocol-support. Also note that we are using the default MaxScale users to get information from the MariaDB Server here, myuser / mypwd. If you use different username / password for this (hint: You really should!) then adjust the MariaDB MaxScale configuration below accordingly. Note that we are using the proxy protocol here, this is to make life with MariaDB MaxScale a bit easier but you also have to enable the proxy protocol in MariaDB Server for this to work. Check this page for instructions on how to set up the proxy protocol support on MariaDB Server: https://mariadb.com/kb/en/library/proxy-protocol-support/. The next step is to set up a service, and for a service to work, we also need a listener. There is just one thing in the above configuration which is a bit out of the ordinary, which is that we set an explicit address for the listener. If we don’t do that, then the listener will listen on all addresses / hosts, which specifically wasn’t what we wanted. We will listen on 192.168.0.111 also, but that will be a different listener thread. For monitoring we will use a different host, 192.168.0.111, so we need a new listener and a service. To protect this port from any but the commands we want to run we also need a filter, so let’s start with that. We are to use a regex filter here, but in a rather unusual way. Mostly, regex is used to replace parts of the syntax like some outdated statement or some minor compatibility feature. In this case, we will filter out most statements and only retain a few commands. In shhhhhhhor, we are to allow a few show commands, and all other commands will be replaced with a SELECT with an error message. The filter looks like this, note that this is an example, so feel free to update it to fit your needs. So any command that doesn’t start with “show variables”, “show global status” or “show processlist” will be replaced with the command “SELECT ‘Not allowed’”. With that in place, we are now ready to set up the corresponding service and listener. This service and listener is different from the one we just created in two ways, first it use a different host (192.168.0.111) and secondly it also included the filter we created above. Except for this, nothing special. At this point our configurations should be correct, so let’s restart MariaDB MaxScale. So, now we can try to access MariaDB Server through MariaDB MaxScale, but on the other port, designated for monitoring only and only allowing certain commands. This is a simple example of something that MariaDB MaxScale can be used for. 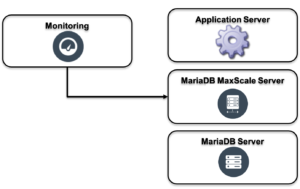 If you are using MariaDB MaxScale already, then you are probably using it for load balancing or high availability or a combination of the two. But if you are, you can always combine that use with some other use, like the one outlined above.